In the early years of Tewkesbury Historical Society, there was always a tingle of anticipation in the autumn as we wondered just what would be the title and content of Miss Day’s annual article for the Bulletin. She wrote regularly from 1992 until her last was published in 2005 when illness prevailed. 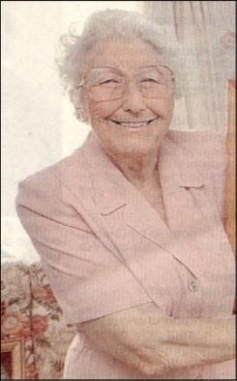 There is no such anticipation in 2014 as Norah Day died, after a long deterioration in health, at Knightsbridge Lodge Nursing Home on 29 August. She was one of the first Life Members of the Society - and rightly so, because, long before the Society was conceived, Miss Day had the reputation of being one of the leading local historians. She will always enjoy that reputation because her book, They Used To Live In Tewkesbury, had been published in 1991, the year that THS emerged. It is still in demand today, as it acts as a ‘Bible’ for family historians and also carries the most valuable appendices of facts gleaned from hours of study in the county archives. She also kindly agreed to let us digitise these appendices for the Society’s Computer Database. This is somewhat ironic, since this was the last sentence that she ever wrote that was published by the Society in 2005: "No computer can ever take the place of [handwriting]"! It was also typically modest of Miss Day to perplex readers - as her book was merely written by ‘Tewkesburian’. That last article concerned her school days, which did not start auspiciously at all until, after some difficult experiences, she passed the scholarship for the Girls’ High School [until 1972 situated between Church Street and the Swilgate]. She seems to have thrived there - despite the unenviable appointment as Form Prefect. When asked by her headmistress about her career aspirations, she had been primed by her mother to respond “Civil Service”. She may then have not understood the concept but she went on to spend 43 years working for the General Post Office, with its exam based career structure. When she retired, she was awarded the Imperial Service Medal. 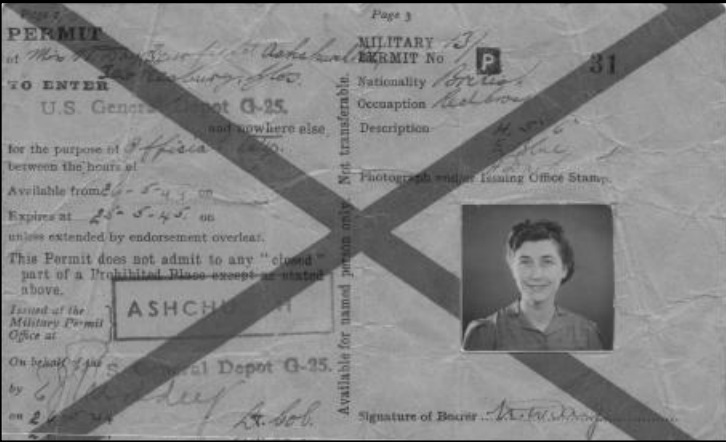 Soon into her new career at the Post Office, then in Church Street, World War II intervened and she obtained extra part-time employment at Ashchurch Camp, from 1943 the most important United States logistical base for D-Day. Below is her permit and she has generously made available photographs from her archive to enrich our knowledge of life at Ashchurch. She inspired me to give talks entitled "How did you obtain your first pair of Nylons" when she revealed, coyly, that she earned them by beating the GIs at poker! In addition she undertook voluntary work with the Red Cross, for which she earned certificates of appreciation. Post war success in her career took her away temporarily from Tewkesbury to Lymington in Hampshire but it was to her home town to which she retired to enrich our lives with her historical writings. Her knowledge was such that she invariably won the quiz at the Annual Society Christmas Social! She possessed, however, more talents than historical research because she was also an artist. I was personally very grateful to this skill. 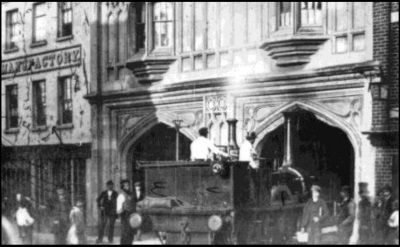 For many years, there was no photograph of Tewkesbury’s High Street Railway Station that we could discover. Miss Day had, however, rectified that omission by painting a speculative picture of that station entirely from a written account published by James Bennett in the 1840s. 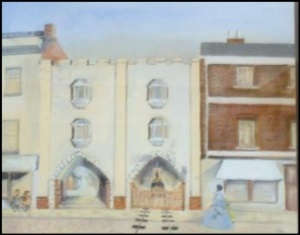 When subsequently an actual photograph emerged, I was really impressed by the similarities expressed in Miss Day’s painting. A fellow founder member of the Society was her younger brother, Cliff along with his wife, Margaret. We had to wait until 2014 for Cliff to follow his sister’s example and write his inaugural article for the Bulletin. To them, and the rest of the family, we extend our condolences as we lose one of our most cherished members. “They used to live in Tewkesbury” by Tewkesburian (Sutton, 1991).